Niece of MLK Jr. Says She Voted for Trump because of His Answer to Racism, Compares Trump to MLK Jr. In the midst of the African-American unemployment level hitting an all-time low and the national holiday we devote to honoring the extraordinary life and works of Martin Luther King Jr., Alveda King, the niece of MLK Jr., was interviewed about her opinion on the current state of race relations in the United States. She expressed that "We are coming along just fine. I am 67 years old, I marched in the 1960's, was jailed for open housing, ..."
She went on to compare her Uncle, MLK Jr., to President Trump, saying "Martin Luther King Jr. was considered to be an agitator, an outsider sometimes, and it reminds me of our leader, President Donald John Trump. Now the President of the United States, he is often compared to an agitator and he's been referred to as a bull in a china shop and all of that. But President Trump is causing us to have these conversations about race relations. If my uncle were here today, he would remind us of that scripture he and my Dad A.D. liked: 'of one blood god made all people, so we are one human race,' and Uncle M.L. said 'we must learn to live together as brothers,' and I added 'as sisters or perish as fools.'" King then highlighted some of the improvements that President Trump is already helping to make, pointing out that he "is working on prison reform, getting some people out of prison back in to the working market. So, unemployment for blacks and for everybody is down, and then the hiring is coming up, we know with the tax cuts, some businesses are now saying 'we'll raise our own minimum wage, we'll give bonuses,' and so all of that is working." 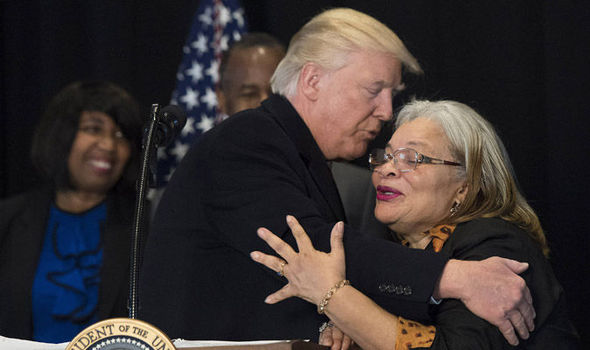 MLK Jr.'s niece went on to reveal that President Trump's answer to racism in America was one of the reasons she voted for him, saying that his "answer to racism has always been the same, that's one of the things that convinced me to vote for him along with his Pro-life stance of civil rights for babies in the womb. They ask him what about racism, he says 'If you give people jobs, a good fair place to live, a good place in society with dignity, then they will get along.' We just want fairness like that." When asked about her reaction to reporters shouting "are you a racist" at President Trump during an event held at the White House the other day to honor the legacy of Dr. Martin Luther King Jr., King replied "that was amazing to me that they were not acknowledging the new legislation that President Trump is signing right here in Georgia with the Martin Luther King Historical park now being a national park, the first named in honor of an African American person... That's going to bring jobs and strength back into these communities," she said.